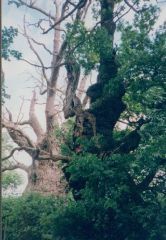 The picture at right is of the 500+ year old Gog and Magog oaks at Glastonbury. Oak Trees are any tree or shrub of the genus Quercus of the family Fagaceae (beech family). On this site, you will be able to get details on several oak tree species, view pictures of the oaks,and find out where to buy oak trees. The oak tree family includes as many as 600 species, found chiefly in north temperate zones and also in Polynesia. Oak is the wood for lumber [timber]: Oaks are cultivated for ornament and are prized as the major source of hardwood lumber. The wood is durable, tough, and attractively grained; it is especially valued in shipbuilding and construction and for flooring, furniture, railroad ties, barrels, tool handles, and veneer. The bark of some oaks has been used in medicine, in tanning, and for dyes. Acorns, the fruit of oak trees, have long been employed as a source of hog feed, tannin, oil, and especially food. A symbol of strength, the oak has been revered for both historical and mythological associations. There are a lot of different varieties of oak and several of holly, and there are some where the outlines of the leaves are almost identical! As for texture - there's an oak with a glossy, shiny leaf like holly, but without the spines, and there are hollies without the spines too - identifying trees can get very difficult sometimes. The two oaks native to the UK, the holm and the sessile are not evergreen, but there are several that are. All the hollies that I know of are evergreen. I think the teberinth is an evergreen - I've seen that in the Mediterrean - and the cork oak - magic bark that has! I understand that of all the oaks, only the teberinth regularly has misteltoe growing in it. The terebinth does not grown in any of the areas where the Druids ended up - so there is a suggestion that druidry came from the general direction of the middle-east or perhaps Black Sea area. Alternatively, when misteltoe did grow on a sessile or holm oak, it was so rare as to be particularly sacred - you pays your money and takes your choice! Here (in the British Midlands) oak, holly and ivy seem to have a close symbiotic relationship. One often sees oak saplings protected by holly trees, and holly groves in the centre of a ring of oaks. "the scarlet-oak, or kerm-oak, or holly-oak, is the evergreen twin of the ordinary oak and its Classical Greek names 'prinos' and 'hysge' are also used for holly in modern Greek. It has prickly leaves and nourishes the kerm, a scarlet insect not unlike the holly-berry (and once thought to be a berry), from which the ancients made thir royal scarlet dye and an aphrodisiac elixir. In the Authorised Version of the Bible the word 'oak' is sometimes translated 'terebinth' and sometimes 'scarlet-oak', and these trees make a sacred pair in Palestinian religion. Jesus wore kerm-scarlet when attired as King of the Jews (Matthew XXVII, 28)." The terebinth is also called the terpentine oak, from which turpentine is extracted. Oak trees are said to grow for 200 years, be in their maturity for 200 years and to take 200 years to die. There are 450 types of oak, I believe, however. So this is mainly referring to the English, holme and similar oaks. Oak is just one of 11 members of the Fagaceae one of which is beech. In handfasting ceromonys the young couple would be given a root ball sapling each. An Oak for the man, to represent strength, and one of Apple for the woman, to represent fertility.